I am a great big geeky dweebhead nerd. I will not engage in the debate about the term “geek” vs. “nerd;” go argue about that elsewhere. No matter what you call it… when I get into something, I tend to get really into it. And I’m not talking about knitting – there is that, but at least on the surface that is a normal, homey sort of pursuit – I love my scifi, my fantasy, my C.S. Lewis fiction, my Tolkein. Most of Osborn Fiber Studio’s drudgework takes place with an old episode of Stargate: SG-1 in the background. I even liked Stargate: Atlantis. We won’t talk about the vats of Trek VHS tapes in my basement. And I will at least try any show or movie that has an actor from Firefly on it, then be disappointed when it isn’t secretly Firefly all over again. So you can probably imagine that the apex of obsessive magic happens when the world of knitting and the world of my favorite fiction overlap. For example. 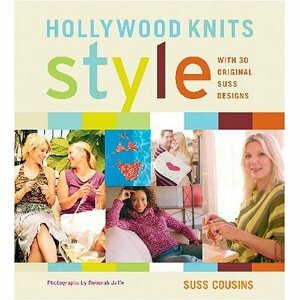 This is a knitting book that I bought just from looking at its cover. Can you figure out why? You have to look closely. Can you figure it out? Yeah. That’s Gina Torres – a.k.a. Zoe Washburne – on the cover, in the purple turtleneck. Seriously, it’s her – it says so next to the pattern inside. Why is Gina Torres in a knitting book? Darned if I know. But that book is now mine. And I am seriously contemplating making the sweater she’s wearing, even though it’s made with cotton held double.